A new survey of US-bound international students finds a high degree of satisfaction among those who have used education agents. Findings from the survey were released this week, and reflect responses from nearly 6,000 students in more than 50 countries. The survey was conducted in March 2017 and published by World Education News & Reviews (WENR). All students were also applicants for World Education Services (WES) foreign credential evaluation and so the respondent base is not totally reflective of the wider population of foreign students in the US. The survey sample is perhaps a bit small for meaningful findings in some global regions, notably Southeast Asia, the Middle East, and North Africa. The survey gathered responses both from students who had used “institution-sponsored” agents (that is, those that had entered into a formal agreement with the receiving institution) and “independent” agents (those that were advising students outside of any formal agreement or association with the receiving institution). The survey focused exclusively on US-bound students, and is composed entirely of those already enrolled, or planning to enroll, with a US institution. Even with those caveats in place, the WENR survey is an important contribution to our understanding of the student experience in working with agents. This is an underdeveloped area of research within international education, and, as a result, the student perspective figures less prominently than it should in consideration of the role of agents in international recruitment. WENR found that roughly 23% (1,336 students out of 5,880) used education agents. This corresponds roughly to a separate study from 2016 which found that US institutions engaged with agents attributed 22% of new enrolments to agent referrals. Of those respondents who used agents, two-thirds worked with “independent” agents while the remaining third worked with “sponsored” agents (i.e., agents that had a formal agreement with the receiving institution). More than eight in ten (83%) were satisfied with the services they received from agents and said that their agents met their expectations. More than 75% agreed that agents provided useful information and valuable suggestions with a similar percentage indicating that they felt the related expenses were reasonable. Nine in ten (92%) of those working with independent agents said that they paid the agents for their services, whereas more than two-thirds of those working with institution-sponsored agents reported paying for services. Roughly half (45%) paid US$500 or less for agent services; another 35% paid between US$501 and US$5,000. Among WES applicants, the use of agents was higher in East Asia (41%) and lower in Europe (19%) and Africa (12%). Use of agents was relatively higher among respondents planning to study at the undergraduate level (80%) as opposed to those planning for graduate studies (73%). Why do students use agents? In contrast, the roughly 4,500 respondents who did not use agents largely felt that they had enough information to apply to study in the US on their own, in some cases with assistance from family or friends. WENR notes the broad service offering within the agent space – ranging from school selection to application assistance to travel and immigration planning – and that agent usage is generally highest at the prospecting stage. 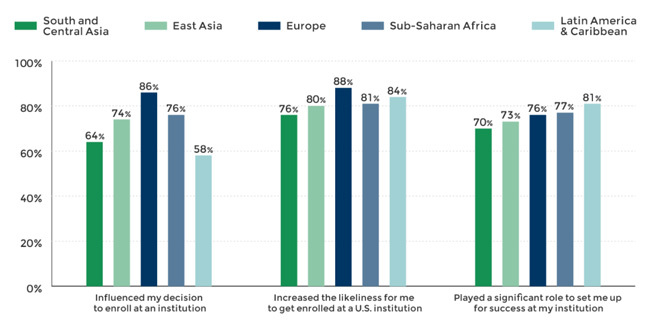 As the following charts reflect, respondents also indicated that agents had a significant effect with respect to the students’ selection of institution and preparedness to study abroad. The overarching conclusions of the report otherwise point clearly back to best practices for engaging with education agents, especially careful vetting of new agent contacts; effective support and monitoring of engaged agents; and an emphasis on transparency and accountability in all aspects of the institution-agent and agent-student relationships. As such, the WENR survey stands as an important contribution to our understanding of the student experience in working with agents, and a valuable reinforcement of what are increasingly understood to be proven business practices and processes for institutions in engaging with education agents. This entry was posted in Agents, Higher Education, North America, Regions, Research, United States and tagged education agents, student recruitment agent, student satisfaction, student recruitment agencies, . Part 2: Videos that work: What’s your strategy?